Life isn’t always easy. In fact, it rarely is. We all know that. Life is the messy thing that gets in the way of all of the awesome stuff we promise ourselves we’re going to do every New Year as the clock strikes midnight. For me, this year is an entirely different monster to tackle. Within the span of one week during the fall, I got engaged and found out that my now-fiance and I needed to move to the Midwest for his job. We currently live in Connecticut, so this move has been a terribly hard pill to swallow for me (a through-and-through Nutmegger). Our careers are both the busiest they’ve ever been, and with a move halfway across the country looming and a wedding to begin planning, I’ve accepted that this year is going to be one full of change, and the changes are going to be significant enough that I may need to put a few new systems in place to keep things running as smoothly as they’ll need to run. I’m not exactly an organizational disaster, but I’ve never really been a natural planner — and truly, I’d bet good money that a lot of you are the same way. It doesn’t come naturally to most people to keep every piece of their lives in perfect order; we often need tools to help us keep all of the important stuff in place so we can move through the murky waters of life in the most organized and efficient way possible. So, in partnership with Adobe Document Cloud, I wanted to share the strategies I’ll be using this year. In short, I’ll be taking myself on a journey to turn actual chaos into more palatable, neat-and-organized chaos in 2019 using this three-step method to keep my life calm, cool, and collected during a period of time that should be anything but. Having a big goal is great — but having a goal within a goal within a goal is somehow so much more organized and achievable. Taking tiny chips out of big scary goals and taking it slow is the way it’ll get done most effectively. Example: when moving cross-country, you quickly realize that you just can’t take all of your stuff — it’s just far too inconvenient. We found out that we were moving west back in November, and I started pretty much immediately diving into the planning and decluttering I knew I’d need to get done before our move in June. 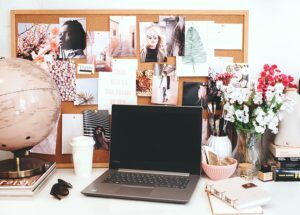 Seven months feels like a lot of time to accomplish something, but the fact of the matter is that you’re probably going to do a messy, ineffective job reaching your goal if you try to do it all at once. Create your organized plan of attack in the form of mini-goals that you have to hit along the way to the finish line. Make a list of every stop you need to make along the way to achieving the overarching goal, and go from there. In the past here on TFD, I’ve referred to the Swiss Cheese Method, which is essentially the same thing. Swiss Cheese method = poking tiny holes in your difficult tasks. This is different than mini-goal-setting in that it is literally just doing the teeny tiny things that are remotely related to the big-picture task in any way so you don’t have to think about them later. When I was a student, this meant opening up a Word document, giving my paper a title, writing my name in the header, and saving it to go back into later, so it was just one small piece of my project that I no longer had to think about. Now that I’m wedding planning, it means getting small, seemingly negligible things done here and there that over time will add up to the plan falling into place. Doing something like buying one white pillar candle every time I see one in a store means that I’ve broken up the task of getting table decor rather than doing it all at once. Spending 15 minutes during my lunch break googling wedding photographers in my area made me feel like I had actively begun that process, even though it hardly took any time at all. What at first felt entirely too daunting to begin now has enough holes poked in it that it feels a lot lighter and more manageable, because I’ve gotten small bits of it done along the way. 2. Treat the really important stuff with the care it deserves. Case in point: Taxes. Contracts. Bills. All of that stressful grown-up stuff that — spoiler — isn’t going away (ugh). My old method for storing important papers was essentially storing them atop my desk until they were covered up by other important papers, or a makeup palette, or a sweater that I for some reason threw on my desk instead of putting in my closet because that is truly The Move as a young woman with tons of clothes. And of course, I take care of most everything when I absolutely need to — I’ve filed my taxes every year, and never had a late payment on anything. But I’d be lying if I said I haven’t come close. Fun fact: I paid my car tax bill last week the very day it was due because by some stroke of luck I happened to move the piece of paper that was covering the bill that was sitting on my desk. Not cool, Mary! That’s why I’ve turned to Adobe Document Cloud, and it’s truly a lifesaver. Since all of this moving chaos is beginning to swirl around me right in the thick of tax season, I’m using Adobe Scan and Adobe Acrobat to help me keep all of my documents organized, and to follow my #1 rule regarding important documents: always keep them in more than one place so you always have a backup. I can easily scan my paper tax documents and save them as PDFs with Adobe Scan, then combine and organize the files using Adobe Acrobat. If you’re worried about having such important documents stored in the cloud (and it is okay if you are — it is good to be discerning and ask important questions when it comes to something as important as your taxes!) you really don’t have to be. You can secure and protect your most precious papers with a password so no one can access them but you (which is super important). Check out this step by step guide to see how Adobe Document Cloud can help you easily tackle your taxes like a boss. I’ve also begun using the Adobe Scan app to help me save and organize vendor contracts for my wedding, and keep them easily accessible. When putting the puzzle pieces of a wedding together, you’re often faced with questions like “Exactly how much did that cost again?” or “Precisely what time will this vendor arrive at the venue?” and being able to reach into my pocket, pull out my phone, and have all of my contracts with all of the information at my fingertips has been so helpful. Probably the most important thing you can do for yourself while in the midst of a busy period of time is to make time to step away from it regularly. When your life starts to feel like work work work, cook and clean, rinse and repeat, or every free moment of time you have is dedicated to a stressful, larger goal like moving a household across the country, or launching a new business, or planning a large, heavily DIY’d event, you need to schedule yourself some time to step away from the chaos, because honestly, you probably won’t be able to properly get through or handle the crazy if you’re always consumed by it. Schedule nights during your busy weeks to do enjoyable things that bring you out of the stressful space, like taking date nights with your partner, spending time with friends and family, or participating in enriching activities like group exercise classes or hobbies that are meaningful to you. If even that seems a little overwhelming amidst the chaos, stick to old faithful: an adult beverage of choice, and a relaxing night on the couch watching a good movie. Remember that your mind and body don’t function the way you need them to unless you give them time to rest, so for god’s sake, give them time to rest. You’ve got a lot to get done this year, I’m sure. So rest up, get yourself organized, and do it — you’ve got this! Don’t forget to check out Adobe Acrobat and Adobe Scan!